​R&R Trailers in Three Rivers Michigan. With their help and patience, we were able to custom design the trailer to our own needs. This included the installation of three windows, a camper door, an awning and a roof rack. Why not purchase a luxury factory built RV?? heavy factory built trailer along with all of our 'add-ons'. ​We wanted to start off light without the worry of the extras we knew we would be adding. 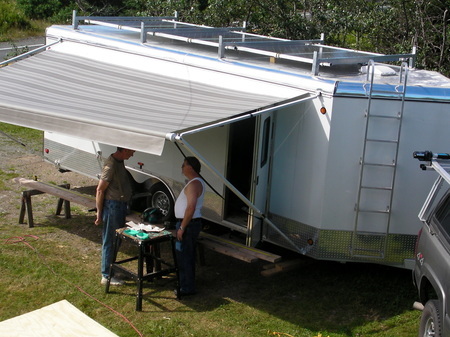 There are six solar panels installed on the trailer giving us over 1000 watts of power. If you look at the image on the left, you will see the panels firmly secured to the roof rack. This supplies enough power to our Lithium Ion batteries to keep not only our refrigerator and separate freezer running, but also television, lighting, our electric blanket, as well as unlimited power for our smartphone, tablets and laptop. The best part is, during the day, we are able to run our mini-split a/c directly off the panels (as long as the sun is shining). We purchased the panels over a period of time from PVPower not only because their sales and customer service staff were always helpful and informative, but their prices were usually better than their competition. The tanks are a perfect fit under our queen size bed. No, don`t worry, there is no odor coming from under the bed. The plumbing is perfectly installed and the vents work well. The big advantage of having the water tanks inside the trailer is that we do not worry about the pipes freezing, should the weather get cold enough for that. So far, we have not run out of water or had any issues with the black water overflowing. We just have to monitor the grey water. 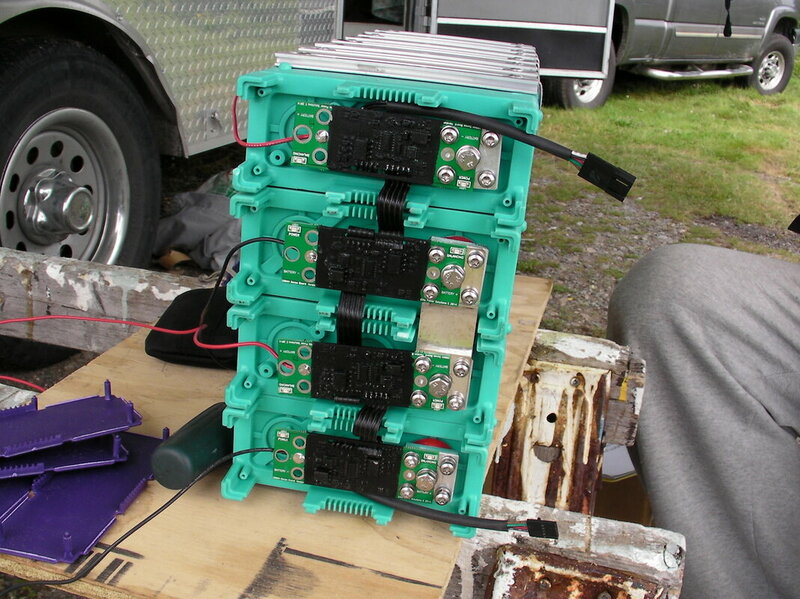 ​After making do with our run of the mill lead acid batteries for a few journeys, we decided that we wanted more out of our solar energy because lead acid was just not enough for our needs. So, after much research, we contacted Elite Power Solutions. We found their customer service to be top notch and their engineering knowledge was excellent. They were always happy to answer our questions. Shipping of their batteries was handled professionally via UPS. Although we do have a propane (gas buddy) backup heater and a mini-furnace, our main source of heating and air-conditioning is a mini-split air conditioner that we installed ourselves. It is manufactured by Klimair, which we find runs very quietly and uses a minimal amount of power. On a cold winter morning, we can easily run the mini-split off our Honda Generator on low power. The Air-conditioner will run quietly on a sunny day directly off the Solar Panels. NOTE!! In order to run your mini split in your RV off your battery or directly from the solar panels, it is important to get one that has inverter technology built into it. We recently installed a nifty mini ducted propane heater for better overnight heating with our windows closed. This has not been tested yet, but we will update our thoughts once we start our next journey. Based on our experiences of other campers noisy generators, generally, we do our best to not run one. However, our very quiet Honda Generator has served us well over the years. When we are on the road, it is a permanent fixture in the back of our Silverado truck, with a specially rigged vent that enables us to keep the truck partly closed up through the night, even when the generator is running. The remote control is very useful for starting the generator in the middle of the night when it's just too cold to be outside trying to start of stubborn generator. Apart from the regular filter that is installed on the trailer, we have installed an RO (Reverse Osmosis) filter under our kitchen sink, which has proven to be one of the best things about our trailer experiences. It is very comforting to know that no matter where we are staying, the drinking water we have in our trailer is remarkably clean and tastes just wonderful. The benefit of designing our own kitchen, is we could make room for the installation of the filter, unlike a factory built RV that could never accommodate this type of add-on. Thankfully, we do not have the hassle of a power hogging electric hot water heater to worry about. We chose the easy route of installing an on-demand propane heater which supplies hot water to the kitchen and bathroom area. So far, we have had ample hot water to wash and shower with and the unit only hiccupped once, when the pilot light battery ran low. We would recommend this type of water heating system to anyone who is thinking of installing a new water heater into their units. Because we wanted to take our boat on our trips, this was a real luxury purchase that we could not do without. With the help of a motor and some carefully placed ropes, our 14 foot fishing boat is easily lifted from the top of the truck straight into the water and back up again. Because we love to camp near water, we have used this system for a number of our trips and would highly recommend it to others. We purchased our boat loader from 4Boys Manufacturing (Load my Boat) primarily because of the all-aluminum constructions, which has proven to be a valuable feature, considering our time spent in the ocean in Florida.